As a business working in Bath, Bristol & Frome, it is hard not to notice the need so many people have for help with drug & alcohol dependence, as well as support finding housing. This year, we have decided that we want to support the work of DHI. 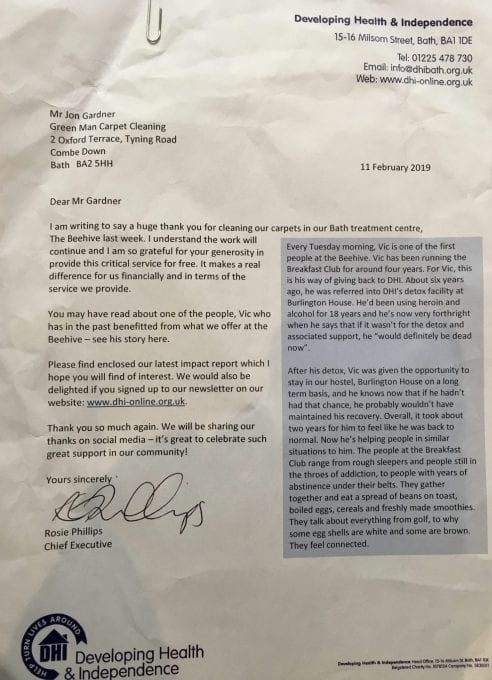 In February, we conducted our first deep-clean free of charge at DHI’s Beehive in Bath, and we will provide a deep-clean every three months ongoing. If you would like to find out more about the work of DHI, visit their webpage here. If you would like to make a donation to DHI, their donation page is here.